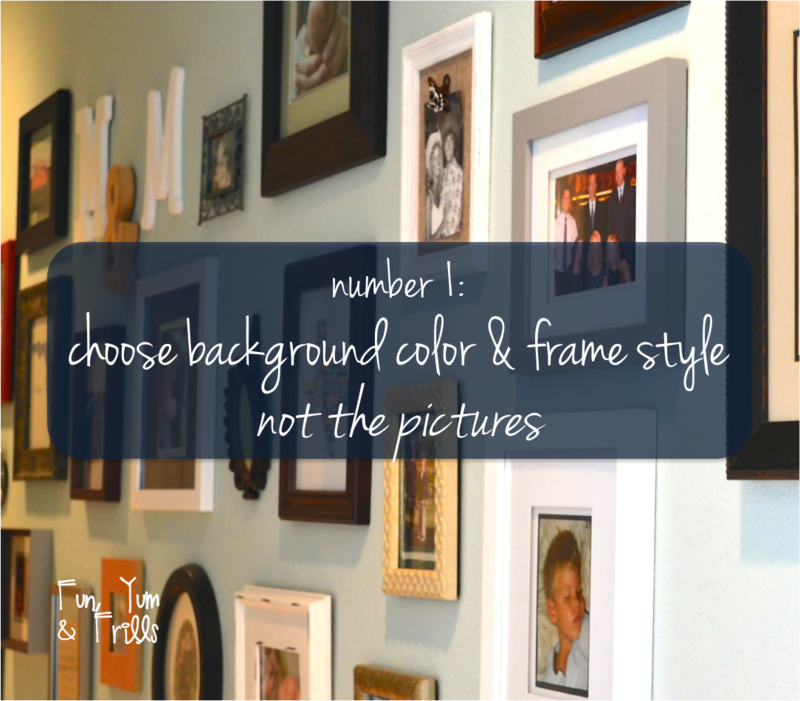 First things first, decide on a killer background color and if you want to do matching or mismatched frames. If your wall is not already painted, pick a color, any color! It won’t need to match the colors in your pictures – it just helps accent the pieces (especially if you do some cool see through frames). Then, decide if you will do all the same color frames/backing or a variety, like mine. Do this BEFORE deciding on your pictures. Think of it this way, the artist sketches before he fills in the canvas. This is the same concept. Next, you gotta gather those frames. All I can say is, MICHAEL’S!!! 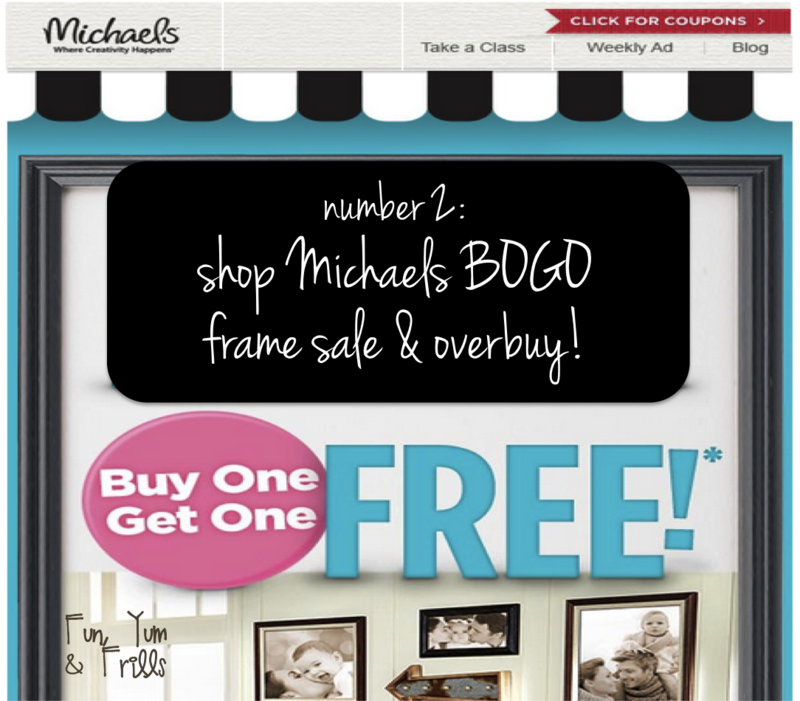 They always have at least a 40% off one regular price item but better yet, they occasionally have BOGO on frames – that’s what you wait for. I actually waited for the BOGO on frames and then the additional 20% off total purchase – oh ya, I was skipping out of there that day. 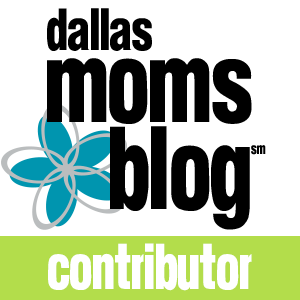 And here’s another thing – overbuy! 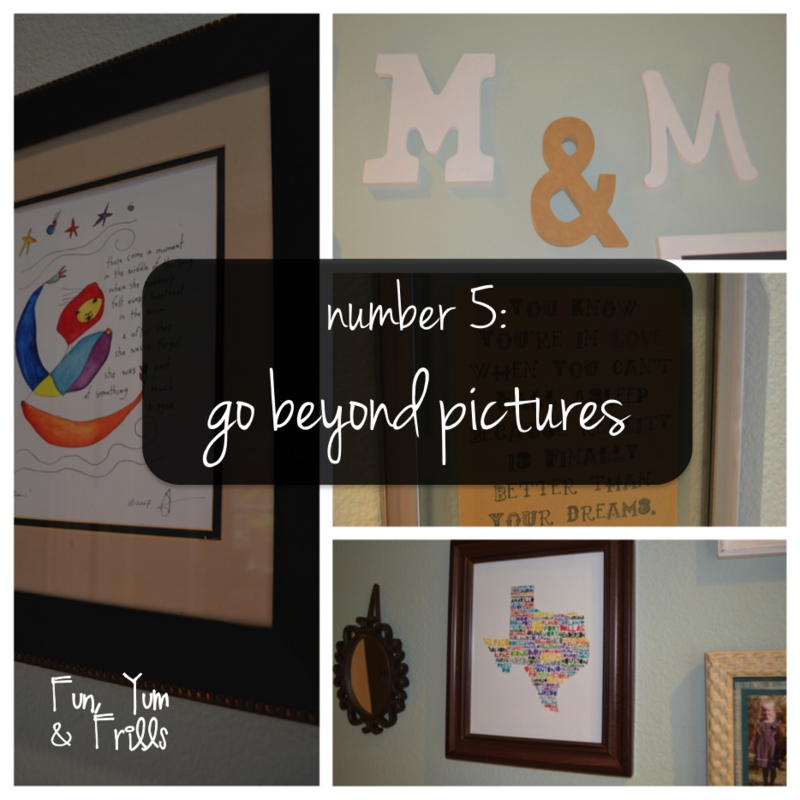 You will want options – options with frames, options with pictures, etc. The joy of picturewalls is that over time you can add to them or change photos out – it’s an ever evolving artistic wall in your house. So, if you have a ton of frames left over, take some back but also hold on to some for future additions. 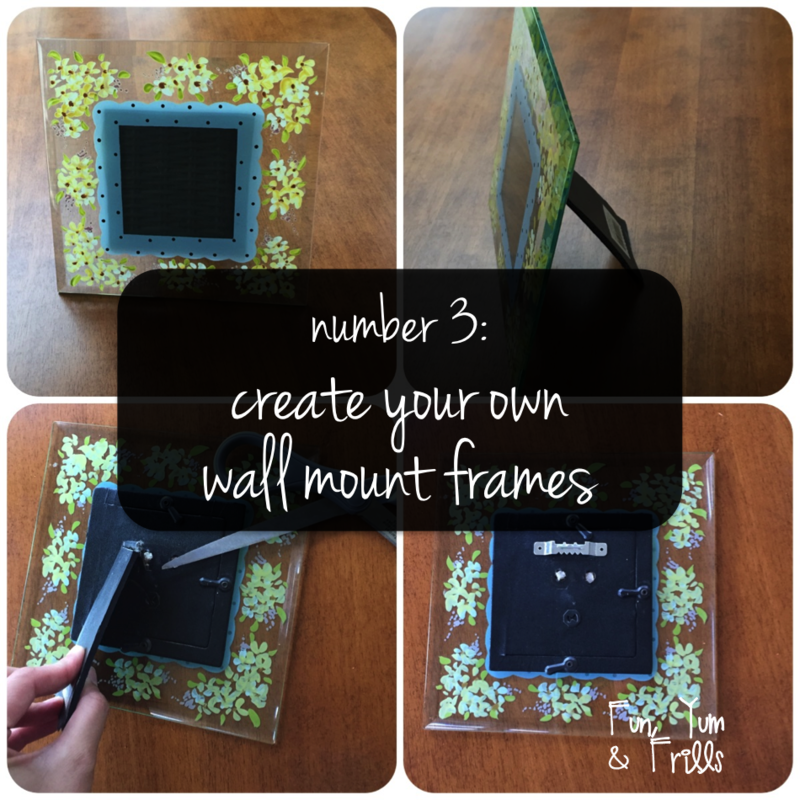 Don’t limit yourself to wall mount frames. Often times, non-wall mount frames have more detail and pizzaz than wall mount frames & can be cheaper! Not to mention these are often smaller frames and can help add some dimension. So don’t veer away from them. If you’re wondering how these will work on your wall, just put some scissors under the bracket, apply some pressure at an angle and they pop-off pretty easily. If they don’t already have a hook on the back, just pick up some picture hooks and add them – BOOM, your new wall mount frame. 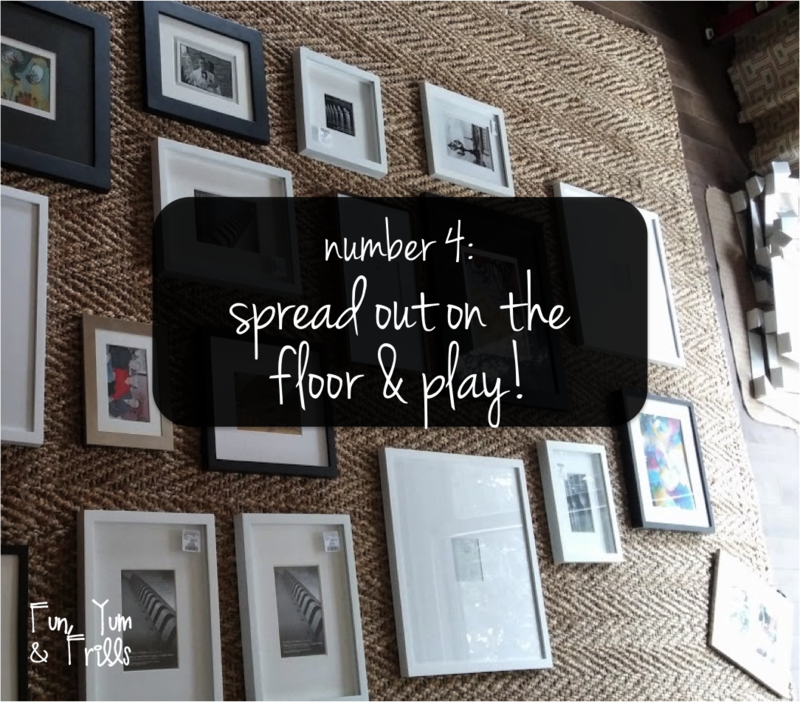 Now, find some floor, spread out & play! Here’s the deal, the only thing that matters on picturewalls really is that they hang straight. The distance between them, how much of the wall it fills up, what you put in the frames, etc is all subjective. I would suggest not having a huge wall and only hanging 4 or 5 pictures, but you get the idea. So, what I did was measure the general length & height I was thinking, wrote it down and then found a big patch of open flooring space that would allow for that size. I took out all my frames and any already framed artwork I knew I wanted on the picturewall and just started arranging things until I filled up that space. Once I kind of liked where things were, I then started looking through pictures I had and either laid them on top of frames or put sticky notes on some to remind myself of what I needed to create/develop. Finally, it’s picture time! But here also comes my biggest piece of advice: think beyond just pictures. Contradictory? Well, while pictures of course tell the story of your life, there are often times quotes, graphics & even actual artwork can tell just as much about you and your family. For instance, we have a Dr. Seuss quote that was used in our wedding program – I used a fun font, nice paper & it’s now represented. Another idea, my husband grew up in Miami, FL and I, Texas. So I found two different images of these states and have them represented on the wall.